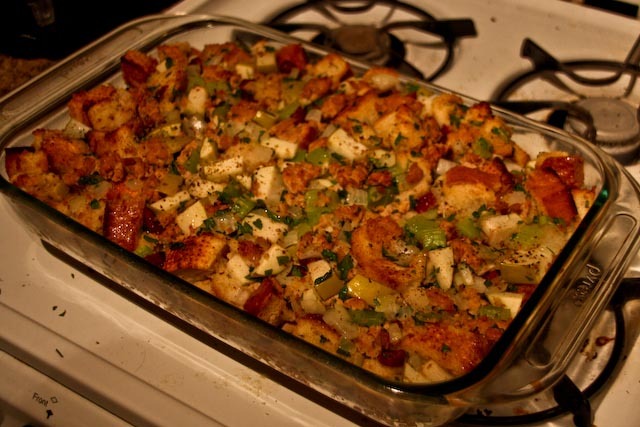 Thanksgiving Sides: Part 3 – STUFFING!! 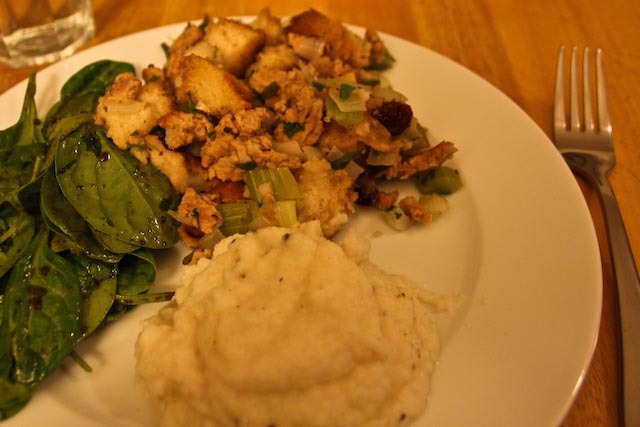 Stuffing has got to be THE classic Thanksgiving side dish, and there are hundreds of things you can put in stuffing to give it a unique and flavorful twist. 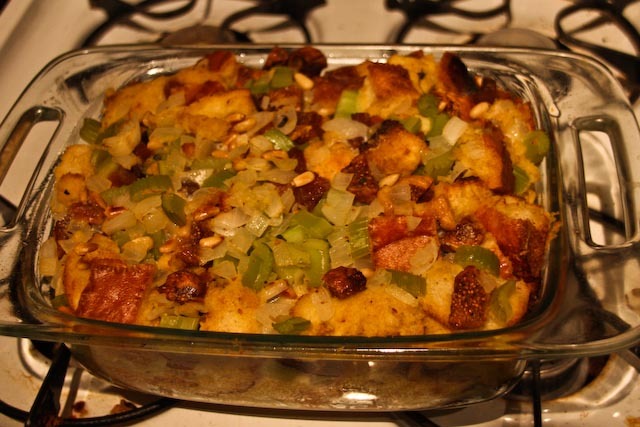 I’ve decided to make two different stuffing recipes, which I think are quite delicious and add a little something different to the Thanksgiving feast. 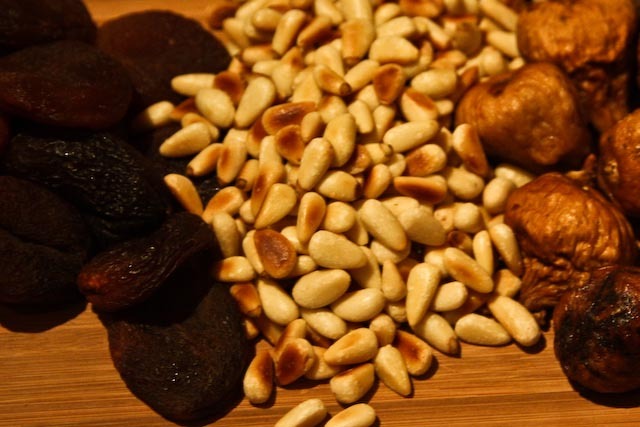 First up is fig, pine nut and Turkish apricot stuffing. The recipe is based on one I found in Real Simple Magazine last fall. It’s vegetarian and is super easy to make. The fig, pine nut and apricot stuffing called for two beaten eggs mixed into the stuffing, which I think helps everything really stick together in the baking dish. 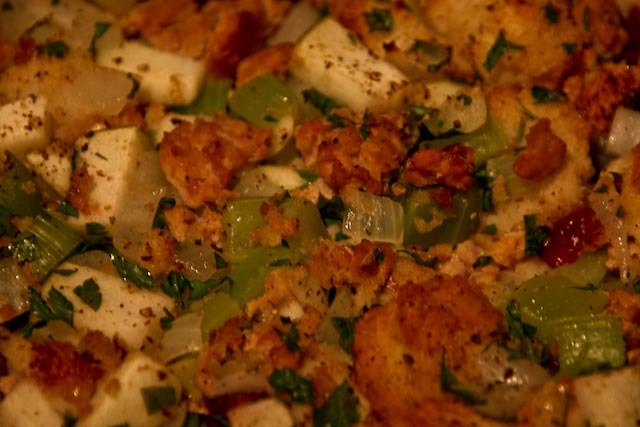 This vegetarian stuffing has a really great slightly sweet flavor that would work really well alongside turkey, pork, or chicken. 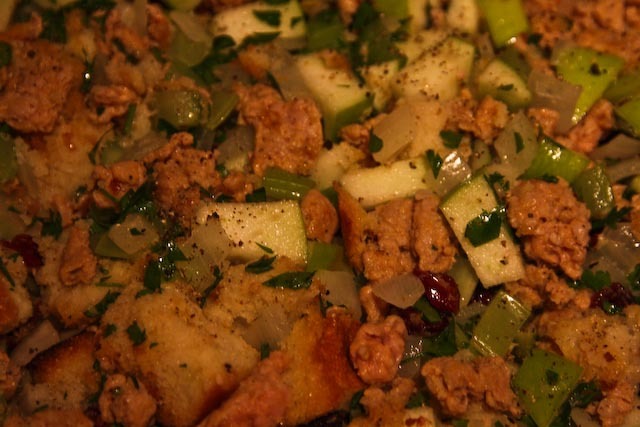 Next up: Italian sausage and apple stuffing! This stuffing is quite obviously not vegetarian, but it is as equally flavorful as its vegetarian compadre. 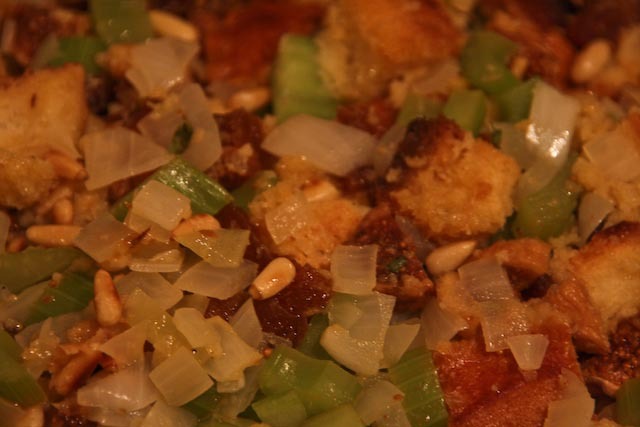 This stuffing is based on the recipe from Ina Garten. 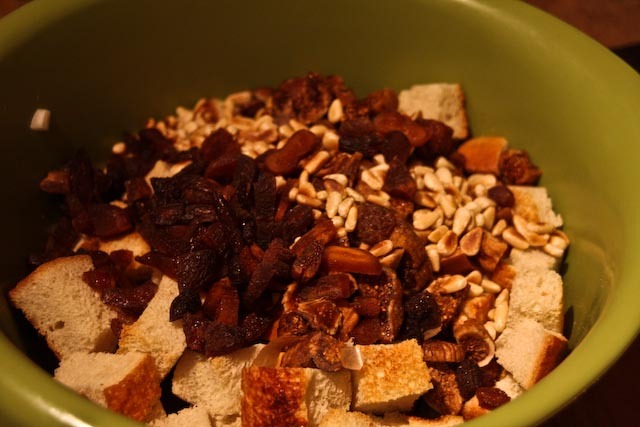 I got a little carried away while making the stuffing and, coincidentally, forgot to take photos during the process! BUT, I do have some photos of the finished dish (before and after baking) and you can find the full recipe below. 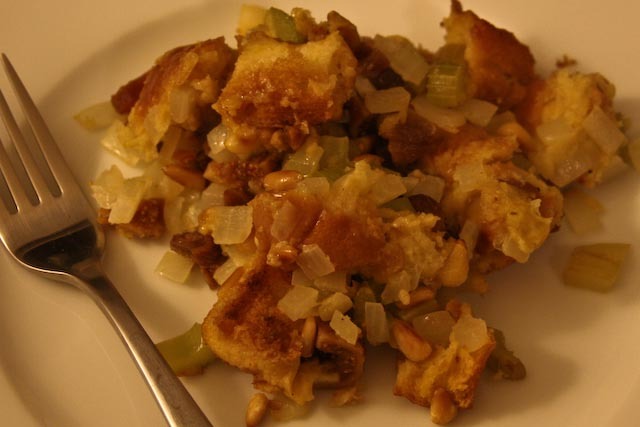 I have to say that I think this recipe could be further enhanced by adding in 1/2 cup of white wine to the saute of onions and celery, as well as adding the 2 beaten eggs into the mix in order to hold everything together, for which the first stuffing recipe calls. I hope that you enjoy these – or any other deliciously unique – stuffing recipes this Thanksgiving! Preheat oven to 400°F and grease a 9″ x 13″ baking dish. Divide the bread cubes between two baking sheets and bake until dry and crisp, about 10 minutes. Set aside. Melt the butter in a large skillet over medium heat. 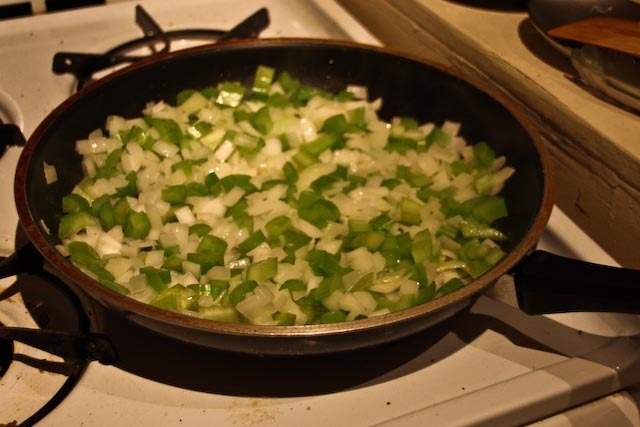 Add the onions and celery, and season with salt and pepper. Cook, stirring occasionally, until the onions and celery are very tender, about 10 minutes. Add the wine and cook until evaporated for about 4 minutes. Transfer to a large mixing bowl and let cool for a few minutes. 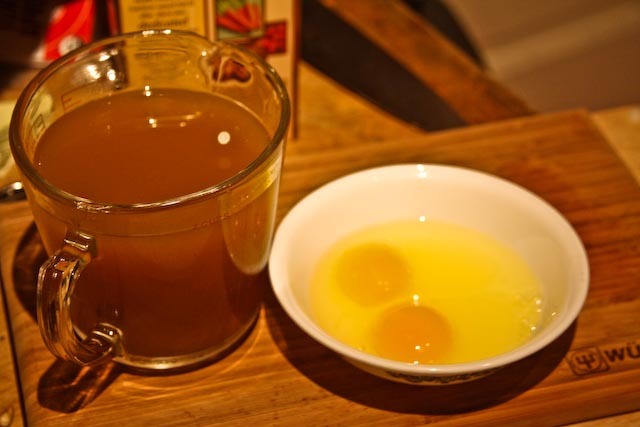 Add the bread, vegetable broth, eggs, figs, apricots and pine nuts, and season well with salt and pepper. Toss everything together to combine well, and transfer to the baking dish. Cover with foil and bake at 400°F for 20 minutes. Uncover and bake for an additional 20 minutes until the top is just browned. Preheat oven to 400°F and grease a 9″ x 13″ baking dish. Divide the bread cubes between two baking sheets and bake until dry and crisp, about 10 minutes. Set aside. Melt the butter in a large skillet over medium heat. Add the onions, celery, apples and parsley and season with salt and pepper. Cook, stirring occasionally, until the onions, celery and apples are very tender, about 10 minutes. Transfer to a large mixing bowl and let cool for a few minutes. In the same skillet, cook the sausage over medium heat, breaking it up with a fork or wooden spoon, about 10 minutes. In the mixing bowl, add the bread, chicken broth, cranberries and sausage. Toss everything together to combine well, and transfer to the baking dish. Cover with foil and bake at 400°F for 20 minutes. Uncover and bake for an additional 20 minutes until the top is just browned.